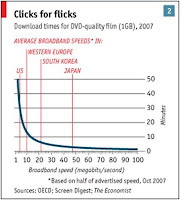 There are several common misconceptions about dial-up connection speeds. For example, even if you are using a 56K modem, you are unfortunately not really connecting at 56 kbps. Because of physical limitations and FCC regulations, the highest connection speed possible on dial-up is 51-53 kbps. Most people connect at about 24-48 kbps (kilobits per second). When you first get connected on dial-up, you should get a pop-up in the lower right corner of the screen telling you your connection speed, e.g., "You are now connected at 32.4 kbps." If you don't see a pop-up, you can also check your connection speed while you are connected. From your control panel, open your Network Connections window and double-click the icon for your dial-up connection. Your connection statistics should show in that window and the speed will be listed first. Once you determine your speed, you can determine download times. However, you must first understand units of measurement and conversion rates. When measuring transfer rate (ie., how many bits can be downloaded per second) of Internet connections, the size increments are 1000. Therefore, a kilobit is 1,000 bits, and an megabit is 1,000 kilobits, etc. Storage capacity on hard drives and cell phones, etc., and sizes of files or software programs, etc., are measured in bytes. This is not to be confused with bits. A byte is 8 bits strung together. Bytes are notated with a capital B, and bits with a small b. Therefore, a "kb" is a kilobit and a "KB" is a kilobyte. Bytes are always in size increments of 1,024 since they use the binary counting system used to store information on computers. Therefore, a kilobyte is 1,024 bytes, and a megabyte is 1,024 kilobytes, etc. Since everything you download from the Internet is measured in bytes (webpages, files, pictures, and programs), you have to do a little math to understand how quickly dial-up (measured in bits per second) can download it. Remember, a byte is 8 bits, and one KB is 8 kb! First, multiply the file size in kilobytes by 8 to convert the file to kilobits. Then, divide it by the number of kilobits per second your connection will transfer. For example, if you want to know how quickly a 500 kilobyte (KB) file (perhaps a picture that was emailed to you) will download on a 40 kbps connection, first convert the file to size in bits. 500 kilobytes (KB) = 4,000 kilobits (kb). Then divide the bits by 40 kbps. 4,000 kilobits / 40 bits per second = 100 seconds, or almost two minutes. Larger downloads are often measured in MB's, which means you have to convert them to KB's before you can convert them to kb's. 1 MB = 1,024 KB = 8192 kb. 1 MB on a 40 kbps connection would download in 204.8 seconds, or just over three minutes. A song is usually about 3 MB, so it would take about 10 minutes. If you downloaded a large program like Adobe Reader, which is 35.7 MB, the download time would be about 2 hours on a 40 kbps connection. The actual download time will be close to your calculation, however, your connection speed can change while you are connected if your modem has to adjust its speed to accommodate line noise. Your download times may also be longer if other processes on your computer are using your Internet connection, such as automatic updates or web-surfing while you wait. Minimize your online activity during a download and check with your local computer technician for ways to eliminate bandwidth-consuming processes faster downloads.